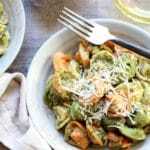 Colorful tortellini tossed in a herbaceous Thai pesto sauce brings so much flavor to this easy Asian-inspired dish! Pair it with a glass of your favorite white wine! To make the Thai pesto sauce: Place all ingredients, except olive oil, in a food processor and pulse until smooth. Drizzle in the olive oil to form a paste. Taste for seasoning. Store pesto in the fridge or freeze until ready to use. To make the tortellini: Fill a large sauce pot with water, add about a teaspoon of salt and bring to a rolling boil. Add in the tortellini and cook about 5 minutes, or until soft to the taste but not mushy. Strain in a colander reserving about ¼ cup of the pasta water. To assemble: In a large serving bowl, toss the tortellini, pasta water, and Thai pesto sauce together until fully incorporated. Top with the shredded parmesan cheese and a drizzle of olive oil if desired. Serve while hot. You can pre-make the Thai pesto and refrigerate for up to four days, or freeze the pesto and defrost when ready to use. The tortellini should take about 5 to 7 minutes to cook so watch it carefully so as not to overcook! The tortellini will be done when it’s soft and pillowy, but not mushy.